Home > Research > Survey >How Likely Is It To Hear About Current Issues At Church? How Likely Is It To Hear About Current Issues At Church? Are Religious Leaders Talking About Current Issues? Most Americans who attend religious services regularly do not hear about certain current issues from the pulpit.¹ Among those who attend religious services at least once or twice a month, only about four in ten say that their clergy speaks out about the issue of abortion (45%) or the issue of homosexuality (42%). Even fewer (32%) say that their clergy speaks out about the issue of immigration. White evangelical Protestants and nonwhite Protestants are more likely than other major religious groups to hear about the issue of homosexuality while attending church. Close to half white evangelical Protestants (49%) and nonwhite Protestants (45%) who attend religious services regularly say their clergy speak out about the issue of homosexuality. Just about one-third of white mainline Protestants (36%) and Catholics (34%) report that they hear about the issue of homosexuality while attending church. Hispanic and black Americans are more likely than white Americans to say that they have heard homosexuality discussed during religious services. Nearly half of Hispanic Americans (49%) and black Americans (46%) report that their clergy talks about the issue of homosexuality. By contrast, fewer than four in ten (39%) white Americans hear about homosexuality while attending religious services. Notably, there are no substantive differences among partisans in whether the clergy at their place of worship talks about the issue of homosexuality. About four in ten Republicans (43%), independents (41%), and Democrats (42%) say that their clergy speaks out about homosexuality. Among white Americans, however, there are differences across party lines. While about four in ten white Republicans (43%) and independents (39%) report that the clergy at their place of worship speaks about homosexuality, only three in ten (30%) white Democrats say this. What Are Clergy Saying About the Morality of Homosexuality? Those hearing about homosexuality during religious services are more likely to hear that it is morally wrong than that it is acceptable. Among regular service attendees who hear about the issue of homosexuality from their clergy, a majority (56%) report that their clergy says that homosexuality is morally wrong. Only 14% report that their clergy says that homosexuality is morally acceptable. Notably, more than one-quarter (27%) of regular service attendees who hear about homosexuality while attending services say that their clergy does not take a position on the issue. Americans are substantially less likely to hear that homosexuality is immoral from their clergy than they were in 2011 when more than three-quarters (77%) of those who heard about homosexuality while attending religious services reported that their clergy said it was morally wrong.³ Only five percent reported that their clergy said that homosexuality was morally acceptable, while 16% reported that their clergy did not take a position on the issue. Republicans are also more likely than Democrats to hear from clergy that homosexuality is immoral. Almost three-quarters (73%) of Republicans report that their clergy teaches that homosexuality is morally wrong. About one in five (19%) say that their clergy does not take a position on the morality of homosexuality, and only six percent of Republicans have clergy who say that homosexuality is morally acceptable. By contrast, just about four in ten (43%) Democrats report that their clergy says that homosexuality is morally wrong.5 One-third (33%) of Democrats say that their clergy does not take a position on the issue, while almost one in five (19%) say they have clergy who say that homosexuality is morally acceptable. Catholics are more likely than other major religious groups to hear about abortion during religious services. More than six in ten (63%) Catholics who attend church at least once or twice a month say that their clergy speaks about abortion at their place of worship. By contrast, less than half (48%) of white evangelical Protestants, about four in ten (39%) nonwhite Protestants, and just 28% of white mainline Protestants hear about the issue of abortion from their clergy. Hispanic Americans are much more likely than white or black Americans to hear about this issue. A majority (56%) of Hispanic Americans who attend religious services regularly say that their clergy speaks out about the issue of abortion. By contrast, only about four in ten white (43%) and black (42%) Americans report hearing about the issue of abortion from their clergy. Republicans are somewhat more likely than independents and Democrats to report that their clergy talks about abortion. Nearly half (49%) of Republicans, compared to about four in ten independents (40%) and Democrats (41%), hear about the issue of abortion from the clergy at their place of worship. Catholics are also more likely than other major religious groups to hear about the issue of immigration during religious services. Close to half (46%) of Catholics say that their clergy speaks out about the issue of immigration. By contrast, just about one-third (36%) of nonwhite Protestants, three in ten (28%) white mainline Protestants, and 16% of white evangelical Protestants report hearing about this issue during religious services. Among those who attend religious services regularly, Hispanic and black Americans are more likely than white Americans to hear about the issue of immigration from the pulpit. At least four in ten Hispanic (45%) and black (40%) Americans say that their clergy speaks out about the issue of immigration. Just about one-quarter (26%) of white Americans report the same. Democrats are more likely than independents and Republicans to hear about this issue during religious services. More than four in ten (42%) Democrats report that the clergy at their place of worship speaks out about the issue of immigration. By contrast, just about three in ten (31%) independents and less than one-quarter of Republicans (24%) report that their clergy speaks about immigration. 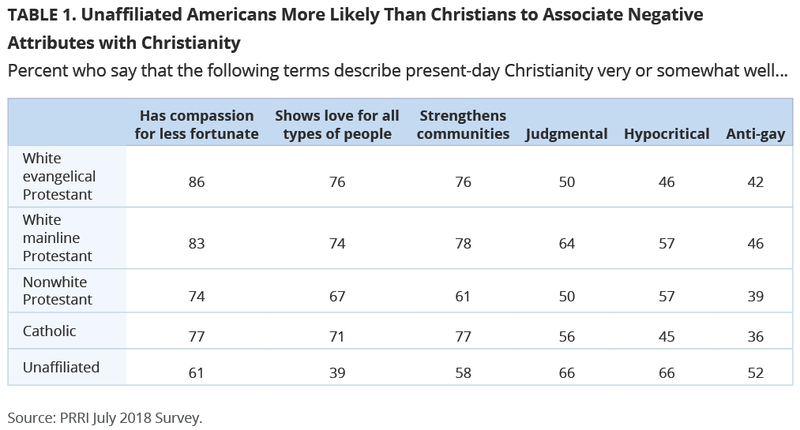 Americans generally agree that Christianity has several positive characteristics. Strong majorities agree it has compassion for those less fortunate (73%), consistently shows love for all types of people (62%), and strengthens communities (69%). Fewer Americans say more negative aspects describe Christianity well. Nearly six in ten Americans say Christianity is judgmental (58%) or hypocritical (56%), while less than half (44%) Americans say present-day Christianity is anti-gay. Unaffiliated Americans are generally less likely than other major religious groups to say that present-day Christianity shows love for all. Fewer than four in ten (39%) unaffiliated Americans say that it shows love for all. By contrast, strong majorities of white evangelical Protestants (76%), white mainline Protestants (74%), Catholics (71%), and nonwhite Protestants (67%) agree Christianity shows love for all. There is general agreement across the religious landscape that Christianity is compassionate and strengthens communities. Majorities of the white evangelical Protestants (86% and 76%), white mainline Protestants (83% and 78%), Catholics (77% and 77%), nonwhite Protestants (74% and 61%), and unaffiliated (61% and 58%) Americans say that modern Christianity is compassionate and strengthens communities. Unaffiliated Americans are more likely than other major religious groups to express negative views about Christianity. A majority (52%) of unaffiliated Americans say Christianity today is anti-gay, a view shared by nearly half (46%) of white mainline Protestants. By contrast, roughly four in ten white evangelical Protestants (42%), nonwhite Protestants (39%), and Catholics (36%) say this is true. Nearly two-thirds (66%) of unaffiliated Americans say present-day Christianity is hypocritical. Notably, nearly six in ten nonwhite Protestant (57%) and white mainline Protestants (57%) say modern Christianity is hypocritical. Less than half of white evangelical Protestants (46%) and Catholics (45%) say the same. Nearly two-thirds (66%) of unaffiliated Americans also say present-day Christianity is judgmental. This view is shared by about six in ten white mainline Protestants (64%) and Catholics (56%) and half of non-white Protestants (50%) and white evangelical Protestants (50%). Young Americans (age 18-29) are far more likely than seniors (age 65 and over) to say present-day Christianity is hypocritical and anti-gay. 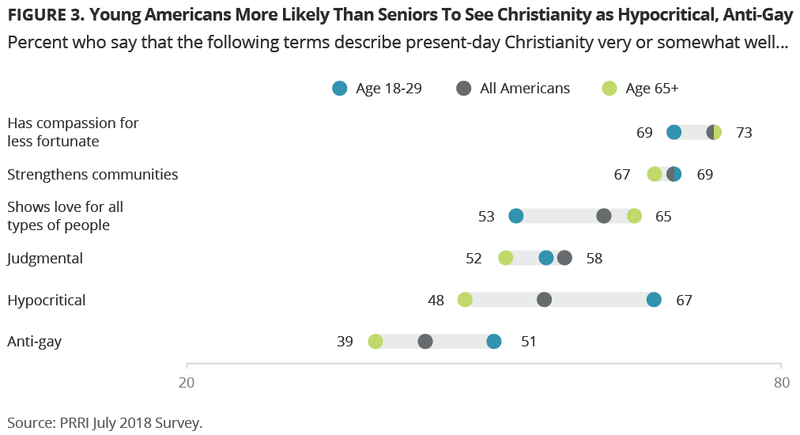 Two-thirds (67%) of young Americans say Christianity is hypocritical, a view shared by fewer than half (48%) of seniors. Similarly, a slim majority (51%) of young Americans say Christianity is anti-gay, while fewer than four in ten (39%) seniors agree. There are strong partisan divisions on this issue, but more notably there is one note of agreement across party lines. More than four in ten Republicans and Democrats say modern day Christianity is anti-gay (49% and 45%, respectively). By contrast, Democrats are somewhat more likely than Republicans to say Christianity is judgmental (65% vs. 53%) or hypocritical (61% vs. 50%). Among whites, the political divide is even wider, with nearly three-quarters (73%) of Democrats saying Christianity is judgmental and nearly two-thirds of Democrats (64%) saying it is hypocritical, compared to just around half of Republicans viewing Christianity as judgmental (52%) or hypocritical (49%). The divide is the largest when considering if Christianity shows love for all. More than eight in ten (81%) Republicans say this description fits Christianity today at least somewhat well compared to just 54% of Democrats. ¹Analysis in this section is limited to those who attend religious services at least one or twice a month. ²PRRI 2011 Millennials, Religion and Abortion Survey. ³PRRI 2011 Millennials, Religion and Abortion Survey. 4Due to sample size limitations, attitudes are not reported among other major religious groups. 5This estimate is taken from a sample of 99 Democrats. Estimate should be interpreted with caution. 6PRRI 2011 Millennials, Religion and Abortion Survey. The survey was designed and conducted by PRRI. The survey was made possible by generous grants from the Arcus Foundation and the E. Rhodes and Leona B. Carpenter Foundation. Results of the survey were based on bilingual (Spanish and English) RDD telephone interviews conducted between June 27, 2018, and July 8, 2018, by professional interviewers under the direction of SSRS. Interviews were conducted among a random sample of 2,008 adults 18 years of age or older living in the United States (1,203 respondents were interviewed on a cell phone). The selection of respondents within households was accomplished by randomly requesting to speak with the youngest adult male or female currently living in the household. The weighting is accomplished in two separate stages. The first stage of weighting corrects for different probabilities of selection associated with the number of adults in each household and each respondent’s telephone usage patterns. In the second stage, sample demographics are balanced to match target population parameters for gender, age, education, race and Hispanic ethnicity, region (U.S. Census definitions), population density and telephone usage. The population density parameter was derived from Census 2010 data. The telephone usage parameter came from an analysis of the 2017 National Health Interview Survey. All other weighting parameters are derived from an analysis of the U.S. Census Bureau’s May 2016 Current Population Survey. The margin of error for the survey is +/- 2.6 percentage points at the 95% level of confidence. The design effect for the survey is 1.4. In addition to sampling error, surveys may also be subject to error or bias due to question wording, context and order effects.